The purpose of this study was to determine whether the angle of the knee joint has an effect on the Fitness Index Scores of the HST. Boyden Gymnasium, University of Massachusetts, Amherst, Massachusetts, U.S.A. The purpose of this study was to determine whether the angle of the knee joint has an effect on the Fitness Index Scores of the HST. Thirty-throe young Caucasoid male subjects were used in this study. The HST was administered in four different knoo-joint angles. A repeated measures one-way classification analysis of variance, a one-way classification analysis of variance and an analysis of covariance were used to analyse the data obtained during nine weeks. All tests yielded significant F ratios at the 0.01 level of confidence. Based on these findings, persons who perform the HST in different knoe-joint angles have indices which are not measuring cardiopulmonary stress on the same scale. The HST based on standardization of the knee-joint anglo promises to inerease the evaluating or discriminating power of the tort. Since, according to Johnson et al. (op. cit. ), the administration of this test is so uncomplicated and the validity so high, the Harvard Step Test has been extensively used in schools, the armed services, and many laboratories. Yet, notwithstanding its popularity, numerous critical evaluations of its validity have appeared. Miller and Elbel (1946) thought a height of 20 in. for the stool to be too high for the subject to maintain a constant body rhythm. Elbel et al. 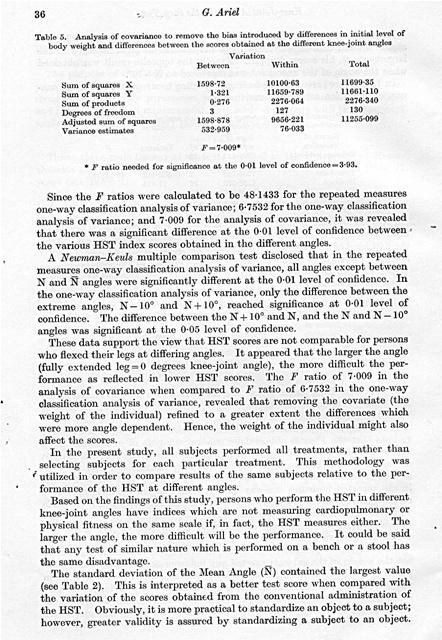 (1958) considered the length of the leg to be a factor influencing the index score. 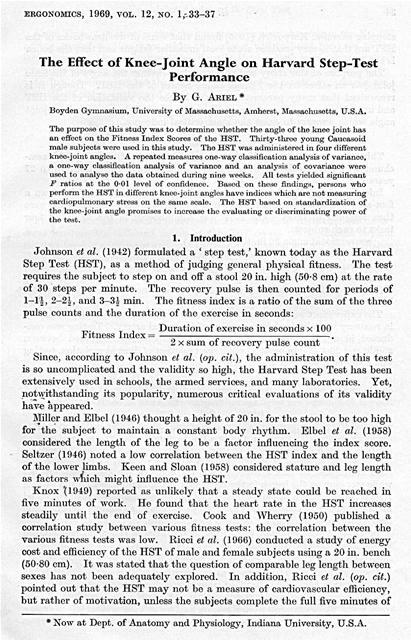 Seltzer (1946) noted a low correlation between the HST index and the length of the lower limbs. Keen and Sloan (1958) considered stature and leg length as factors w ich might influence the HST. * Now at Dept. of Anatomy and Physiology, Indiana University, U.S.A.
stepping exercise. Karpovich (1965) found that some of the drawbacks of the HST are that it may produce acute local muscular fatigue and that the bench is too high. The purpose of this study was to determine whether the angle of the knee joint has an effect on the Fitness Index Scores of the HST. Though it is recognized that many parameters may influence the validation of the HST and introduce error of measurement, this study dealt only with the knee-joint angle which appears to exert the most critical influence. Thirty-three male Caucasoid students enrolled at the University of Massachusetts served as subjects in this study. Their ages ranged from 18 to 27 years (see Table 1). mean of all conventional angles (N=103ï¿½). Subjects performed each task in randomized sequence. An easily adjustable bench facilitated the changing of bench heights. The experiment was conducted during a nine-week period. Pulse frequency in recovery was obtained by palpation of the radial artery. Testing was conducted in a room in which the ambient temperature fluctuated between 25.8ï¿½e and 26.4ï¿½c. 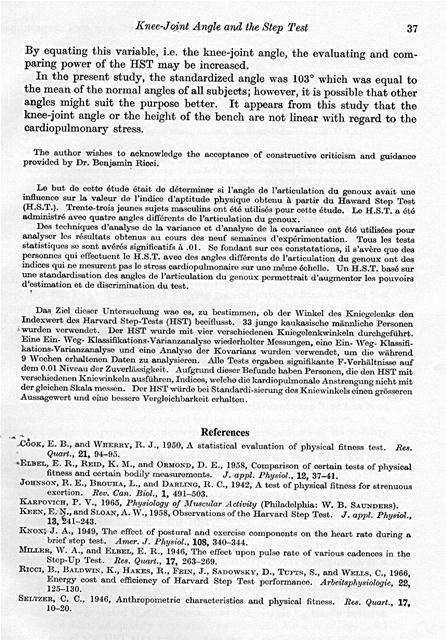 In order to minimize the effect of diurnal variation, testing was conducted between 2 p.m. and 4 p.m.
i In attempting to find whether or not the angle of the knee joint, created while stepping on the bench in the HST, had a significant effect on the Fitness Index Scores, three separate statistical measures were applied: repeated measures one-way classification analysis of variance, a one-way classification analysis of variance, and an analysis of covariance. In Table 2 are presented the means of the Fitness Index Scores attained within the different treatments. From Table 2, it appears that the lowest scores were obtained in the N + 10ï¿½ angle. Stated another way, when the subject had to bend his knee to the largest extent, his scores dropped. Exactly the opposite result was obtained when the angle of the knee joint was decreased to N-10ï¿½. In Table 3 are presented the findings according to a repeated measures, oneway classification analysis of variance. Source of	Sum of	df	Variance	1"
* F ratio needed for significance at the 0.01 level of confidence=-1.01. From the statistical results observed in Table 3 it is obvious that the differences between the different means of the HST scores are significant beyond the 0.01 level of confidence and that the results obtained are not duo to chance alone but there were cause and effect factors present in the study. The findings according to a one-way classification analysis of variance appear in Table 4.
" F ratio needed for significance at the 0.01 level of confidence =3.93. Tt is evident from Table 4 that the differences between the means of the HST scores obtained at the different knee-joint angles are significant beyond the 0.01 level of confidence. 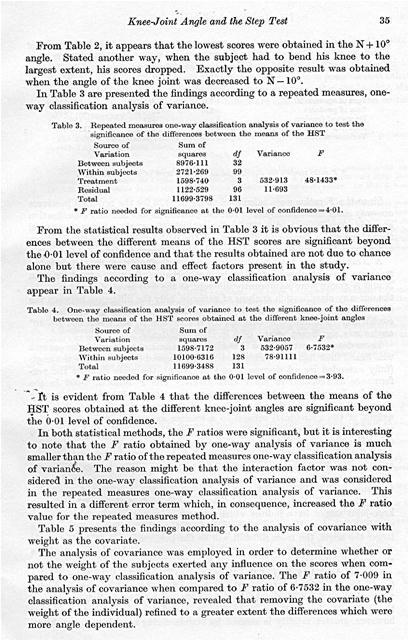 In both statistical methods, the F ratios were significant, but it is interesting to note that the F ratio obtained by one-way analysis of variance is much smaller than the F ratio of the repeated measures one-way classification analysis of variank The reason might be that the interaction factor was not considered in the one-way classification analysis of variance and was considered in the repeated measures one-way classification analysis of variance. This resulted in a different error term which, in consequence, increased the F ratio value for the repeated measures method. Table 5 presents the findings according to the analysis of covariance with weight as the covariate. The analysis of covariance was employed in order to determine whether or not the weight of the subjects exerted any influence on the scores when compared to one-way classification analysis of variance. The F ratio of 7.009 in the analysis of covariance when compared to F ratio of 6.7532 in the one-way classification analysis of variance, revealed that removing the covariate (the weight of the individual) refined to a greater extent the differences which were more angle dependent. * F ratio needed for significance at the 0.01 level of confidence - 3-93. Since the F ratios were calculated to be 48.1433 for the repeated measures one-way classification analysis of variance; 6.7532 for the one-way classification analysis of variance; and 7.009 for the analysis of covariance, it was revealed that there was a significant difference at the 0.01 level of confidence between the various HST index scores obtained in the different angles. A Neuynan-!i eiu.ls multiple comparison test disclosed that in the repeated measures one-way classification analysis of variance, all angles except between N and N angles were significantly different at the 0.01 level of confidence. In the one-way classification analysis of variance, only the difference between the extreme angles, N-10ï¿½ and N + 10ï¿½, reached significance at 0.01 level of confidence. The difference between the N+ 10ï¿½ and N, and the N and N-10ï¿½ angles was significant at the 0-05 level of confidence. These data support the view that HST scores are not comparable for persons who flexed their legs at differing angles. It appeared that the larger the angle (fully extended leg=0 degrees knee-joint angle), the more difficult the performance as reflected in lower HST scores. The F ratio of 7.009 in the analysis of covariance when compared to F ratio of 6-7532 in the one-way classification analysis of variance, revealed that removing the covariato (the weight of the individual) refined to a greater extent the differences which were more angle dependent. Hence, the weight of the individual might also affect the scores.
' formance of the HST at different angles. Based on the findings of this study, persons who perform the HST in different knee-joint angles have indices which are not measuring cardiopulmonary or physical fitness on the same scale if, in fact., the HST measures either. The larger the angle, the more difficult will be the performance. It could be said that any test of similar nature which is performed on a bench or a stool has the same disadvantage. The standard deviation of the Mean Angle (N) contained the largest value (see Table 2). This is interpreted as a better test score when compared with the variation of the scores obtainï¿½d from the conventional administration of the HST. Obviously, it is more practical to standardize an object to a subject; however, greater validity is assured by standardizing a subject to an object. By equating this variable, i.e. the knee-joint angle, the evaluating and comparing power of the HST may be increased. In the present study, the standardized angle was 103ï¿½ which was equal to the mean of the normal angles of all subjects; however, it is possible that other angles might suit the purpose better. It appears from this study that the knee-joint angle or the height of the bench are not linear with regard to the cardiopulmonary stress. The author wishes to acknowledge the acceptance of constructive criticism and guidance provided by Dr. Bonjamin Ricci. Le but de cotto etude 6tait do determiner si I'anglo de l'articulation du gonoux await uno influence sur la valeur do l'indice d'aptit.udo physique obtenu a partir du Haward Step Test, (H.S.T.). Trente-trois jeunes sujots masculins ont 616 utilises pour cotte Etude. Lo H.S.T. a 6t6 administr6 aveo quatre angles diff6rents do 1'artieulation du gonoux. Des techniques d'analyso do la variance of d'analyso do la covariance oat 616 utilis6es pour analyser les resultats obtenus flu tours des neuf semaincs d'exp6rimontation. Tous leg tests statist.iques so sent aver-6s signifleatifs a .01. Se fondant sur ces constatations, it s'av6re quo (leg personnes qui effectuent Io H.S.T. avec des angles diff6ronts de 1'articulation du genoux ont dos indices qui ne mosurent pas to stress cardiopulinonairo stir uno memo bchello. Un H.S.T. b-96 sur une standardi ation des aciglcs de l'articulation du genoux poimottrait d'augrnontor leg pouvoirs d'estunation et de discriminat iun du test. Da9 Ziel dieser Untersuchung wao es, zu bestimmen, ob der Winkel (leg Kniegelenks don Indexwort des Harvard Step-Tests (HST) boeiflusst. 33 jungo kaukasiseho mannliche Porsonon wurden verwendct. Der HST wurde mit vior verschiedenen Kniogolenkwinkoln durchgefuhrt. Eino Ein- Weg- Klassifikations-Varianzanalyso wiederholtor illessungon, sine Ein- Weg- Klassifikationa-Varianzanalyse and oino Analyso der Kovarianz wurden vorwendet, urn die wahrond 9 Wochen erhaltonon Daten zu analysieren. Alle Tests orgaben signifikante F-Vorhiiltnisse auf dem 0.01 Niveau der Zuverliissigkoit. Aufgrund dieser llofunde hahen Personen, die don HST mit vorschiedonen Kniewinkeln ausfiiliren, Indices, welche dio kardiopulmonalo Anstrongung nicht mit der gloichen Skala messon. Der HST wurdo bci Standardi-sierung dos Kniewirdcels cinen grosseron Aussagowert and oino bessero Vergloichbarkoit erhalten. .Coox, E. B., and WHERRY, R. J., 1950, A statistical evaluation of physical fitness test. Res. Quart., 21, 94-95. ELBEL, E. R., Rxir), K. Dl., and ORMOND, D. E., 1958, Comparison of certain tests of physical fitness and certain bodily measurements. J. appl. Physiol., 12, 37-41. JOHNSON, R. E., BRounA, L., and DARL.rva, R. C., 1942, A test of physical fitness for strenuous exertion. Rev. Can. Biol., 1, 491-503. KARrovica, P. V., 1965, Physiology of Muscular Activity (Philadelphia: W. B. SAUNDERS). 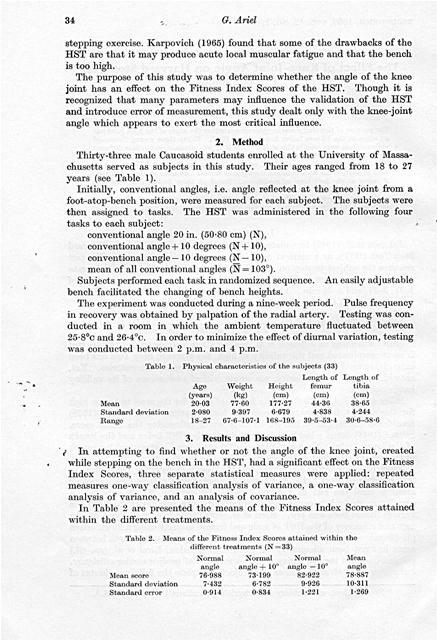 KEEx, E. N., and SLOArI, A. W., 1958, Observations of the Harvard Stop Test. J. appl. Physiol., 13, 1141-243. KNox; J. A., 1949, The effect of postural and exorcise components on the heart rate during a brief stop test. Amer. J. Physiol., 108, 340-344. Mrra.ER, W. A., and ELBEL, H. R., 1946, The effect upon pulse rate of various cadences in the Step-Up Test. Res. Quart., 17, 263-269. Ricci, 11., BALDWIN, K., HARES, It., FEIN, J., SADOWSKY, D., Tuj. rs, S., and WELLS, C., 1966, Energy cost and efficiency of Harvard Stop Test performance. Arbeitsphysiologie, 22, 125-130. SELTZER, C. C., 1946, Anthropometric characteristics and physical fitness. Res. Quart., 17, 10-20. Generated on 4/25/2019 12:48:14 AM (PST) ADI/HQ/GBA/2019/ARIELCLOUD/v3.0.2018.0126.